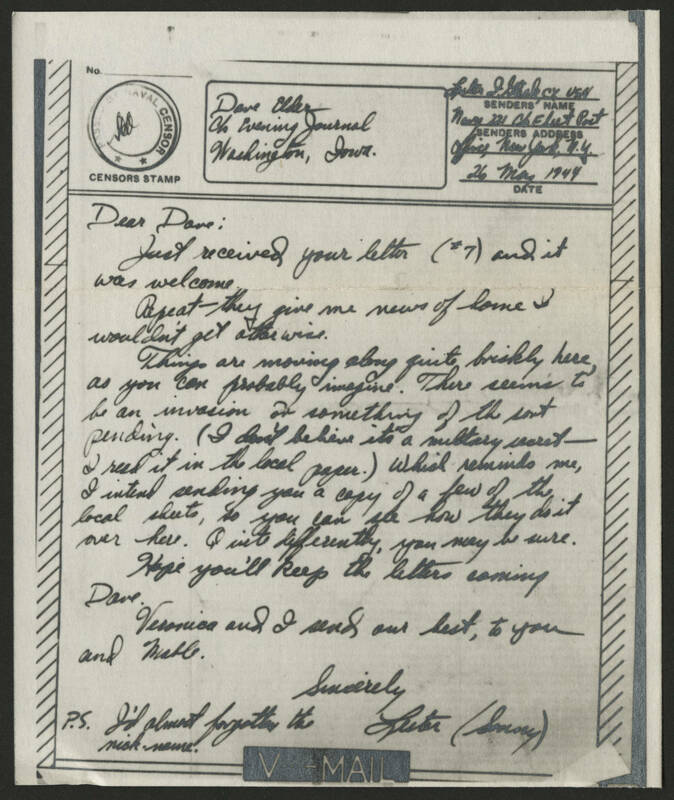 26 May 1944 Dear Dave: Just received your letter (#7) and it was welcome. Repeat-they give me news of home I wouldn't get other wise. Things are moving along quite briskly here as you can probably imagine. There seems to be an invasion or something of the sort pending. (I don't believe it's a military secret - I read it in the local paper.) Which reminds me, I intend sending you a copy of a few of the local sheets, so you can see how they do it over here. Quite differently, you may be sure. Hope you'll keep the letters coming Dave. Veronica and I send our best, to you and Mable. Sincerely Lester [Sonny?] P.S. I'd almost forgotten the nickname.